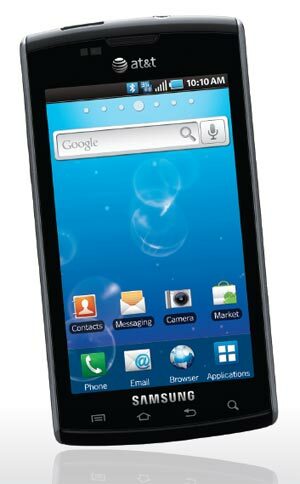 Current Promotion: Get the Samsung Captivate Android Phone (AT&T) for only $0.01! The super-smart Samsung Captivate for AT&T brings a fully integrated entertainment, messaging and social networking experience to your mobile phone, thanks to its open and innovative Android 2.1 platform. You’ll be able to zip through the Web and multitask between a bevy of apps with the Captivate’s 1 GHz processor and ultra-fast 7.2 Mbps 3G connectivity. With integrated Google technology, the Samsung Captivate brings one-touch access to the popular Google mobile services millions use every day, including Google Search by voice, Google Maps with Street View, GTalk instant messaging (with presence capabilities), YouTube, and Picasa. The Captivate also provides easy access to both personal and corporate e-mail, calendars, and contacts supported by Exchange Server and Gmail. And through Android Market, you’ll get access to thousands of useful applications, widgets and fun games to download and install on your phone, with many more apps being added every day. The Captivate has a large 4-inch Super AMOLED touchscreen display that provides brighter, thinner, and higher-resolution than traditional screens. Samsung’s innovative display technology makes watching movies, viewing videos and playing games come to life like never before, even in bright light and outdoor environments. And messaging is simple and easy with the Captivate’s virtual QWERTY keyboard with Swype technology, which allows you to input text faster and in a more intuitive way with one continuous finger motion across the screen keyboard. At 0.39 inches (9.9mm) thin, the Captivate is the thinnest Android smartphone on the market, and it packs in a 16 GB internal memory plus 5-megapixel camera/camcorder with auto-focus and HD video recording (720p resolution). Other features include fast Wireless-N Wi-Fi networking (802.11b/g), Bluetooth 3.0 technology for hands-free devices and stereo music streaming, microSD memory expansion (for optional cards up to 16 GB in size), and just under 6 hours of talk time. Offering one-stop shopping for all your updates, the Samsung Social Hub all your social networking services, messages, personal and business e-mail, calendars and contacts. It’s built around Messaging and Contacts, both of which initiate the sending and receiving of information–whether it is e-mail, instant messaging, social network updates or SMS messages. Additionally, calendar information from portal calendars, such as Google Calendar, and social networking services are displayed together in one calendar with two-way synchronization. The familiar text messaging experience is enhanced with group messaging and “reply all” functionality for up to 10 contacts, a threaded conversations format, a consolidated inbox, and enhanced multi-media display. Ultra-fast Wireless-N Wi-Fi networking (802.11b/g/n) for accessing home and corporate networks as well as hotspots while on the go. Connect for free using one of the over 20,000 AT&T Wi-Fi hotspots nationwide. Swype input system allows you to input text faster and easier by gliding your finger around the keyboard, moving from letter to letter in one continuous motion. The Swype technology then calculates what word you’re intending to type. Samsung Social Hub provides one stop for all your updatesintegrates all your social networking services, messages, personal and business e-mail, calendars and contacts. Intelligent voice processor helps enhance voice and suppress noise for clear communications nearly anywhere. Like the human ear, the chip isolates your voice, and filters out all the unwanted background noise, for unsurpassed mobile call clarity without the noise from a busy street, loud public places, nearby conversations or even sirens going by. Free AT&T Address Book service allows you to sync your contacts to an online address book, enabling you to access and manage your mobile contacts from your handset–or your PC. From the online interface, you can import contacts from other Web-based address books, such as personal e-mail accounts, as well as send text messages to your contacts’ mobile numbers. The Samsung Captivate weighs 4.5 ounces and measures 4.18 x 2.5 x 0.39 inches. Its 1500 mAh lithium-ion battery is rated at up to 5 hours, 50 minutes of talk time, and up to 340 hours (14+ days) of standby time. It runs on the 850/900/1800/1900 MHz GSM/GPRS/EDGE frequencies as well as AT&T’s dual-band 3G network (850/1900 MHz; HSDPA/UMTS). Samsung Captivate Android handset, rechargeable battery, charger, wired stereo headset, USB cable, quick start guide. The current promotion offers the Samsung Captivate Android Phone for AT&T for $0.01 with free two-day shipping included.